A striking new project near the intersection of Parkdale and Barton promises to transform both a local landmark and the lives of the people who will live there. The rejuvenated property will provide a minimum of 56 affordable, accessible, energy-efficient apartments, 3,000 square feet of retail space and a large-scale teaching kitchen. Most of all, it will offer immense potential to improve the lives of its future residents. Results from Indwell’s other projects show a number of improvements in tenants’ situations, including an increase in housing stability by an average of 3.5 years, fewer required emergency services, improved mental and physical health, rebuilt family connections and an increase in community participation. Into every life a little rain must fall—and managing it where it goes helps both homeowners and the environment. With support from HCF’s Dougher Fund, a home visit program from Green Venture offered Dundas residents a personalized 90-minute assessment of their property and basement by a certified RAIN Home Guide. Homeowners learned three simple principles—slow it down, soak it up and keep it clean—and specific techniques to manage stormwater and reduce water consumption, including rain harvesting and rain gardens. A customized report highlighted each homeowner’s five most pressing areas to address. A follow-up survey with participants showed 100 per cent of participants had taken or were preparing to take action on the recommendations. Managing storm water means more flood-resistant communities, fewer wet basements and mould problems, more green spaces and cleaner local waterways. The Dundas program will help reduce the amount of water entering Spring, Sulphur and Spencer Creeks from the storm water system and overland drains during the extreme weather events that are becoming more common with climate change. Caring Dads is a program offered in Canada, the U.S. and Europe that has shown significant success in working with fathers at-risk of using abusive behaviour with their families. Now, the program will be offered in Hamilton for the first time, filling an urgent local need identified by agencies addressing family violence. Thanks to an HCF grant, Hamilton fathers will no longer have to be referred to Caring Dads programs in other cities. Offered by Catholic Family Services, Caring Dads emphasizes helping fathers to build strong, supportive relationships with their children. It works to increase a father’s ability to respond appropriately to kids’ misbehaviour, co-parent with their children’s mothers and put their kids’ needs first. The Hamilton Philharmonic continued its tradition of bringing classical music to new ears with a complementary invitation for families living in City Housing Hamilton to attend its Family Concert Experience. 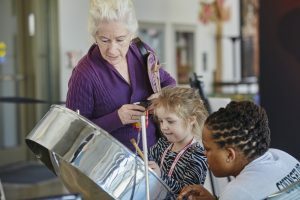 Supported by an HCF Creative Arts Fund grant, the program aims to introduce families to their local professional symphony, create a sense of belonging in their community’s arts organizations and build a special family experience. It included pre-concert activities such as create-your-own-instrument crafts and an instrument “petting zoo”. As an early “welcome to your symphony,” HPO representatives attended tenant meetings to promote the concerts. Of City Housing Hamilton’s 13,000 residents, almost half are children. Essential Aid, a Hamilton organization focused on nutrition for children under four, is filling a critical gap in the food bank system by stocking a wide range of infant formulas. The nutrition needs of infants are unique and many formula-fed infants can’t tolerate a change. Traditional food banks are unable to provide a selection of formula as it is expensive and product donations are difficult to acquire. By offering multiple formulas, Essential Aid assists families in immediate need – no proof of income is required as the organization believes that an emergency can happen to anyone. The infant food bank is seeing an ever-increasing demand; HCF’s grant will help to meet the needs of an average 200 children monthly. Essential Aid also offers a breastfeeding support program which provides education, one-on-one support from a volunteer nurse and supplies. Last year, the organization provided emergency formula, diapers and breastfeeding equipment to 1,765 children, many of whose families were referred by other local food banks. ABACUS is HCF’s initiative to improve graduation and post-secondary access rates by focusing on students in the middle-school years. To support the critical role of teachers in this goal, Hamilton Community Foundation launched a new small grants program – up to $500 – for Grade 6, 7 and 8 teachers to provide enrichment activities that support overall ABACUS objectives. Including exciting ventures like a hands-on opportunity to design, test and build pneumatic and hydraulic systems, to experiencing pre-1850 Canadian history at Battlefield Park, to publishing a student-produced community newspaper, the first round drew almost 70 applications from teachers across the city, reflecting a wide range of projects that share an academic focus and a goal to improve student achievement. A new program at the Ellen Osler Home in Dundas is helping women ease back into the community, before, during and after their release from serving a federal sentence. Supported by an HCF grant, the program provides “in-reach” staff who accompany and assist the women during stressful times such as parole board hearings, and the transition to Ellen Osler which can happen on short notice. Once they arrive at the home, it supports a smoother transition in practical ways, such as helping to pay for transportation to work commitments or reconnecting with family. It also enables the women to participate in community activities – recreational classes for example – that help them build stronger relationships and support beyond their involvement with the correctional system. A recent Hamilton Community Foundation grant to a new partnership project called the City of Hamilton Home Improvement Project (CHHIP) is like making two grants in one. The program brings together the City’s Neighbourhood Action Strategy, CityHousing Hamilton, Threshold School of Building and the Foundation, and works toward a dual purpose: providing job skills to unemployed young people aged 18 to 29, while improving social housing space. The participants are drawn primarily from the City of Hamilton’s priority neighbourhoods. They receive two weeks of training in basic construction skills, and then put knowledge into practice helping to renovate some of CityHousing’s units over the course of six months. 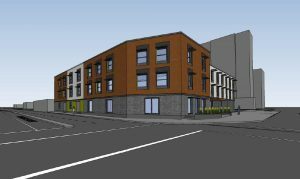 The improvements allow the units, vacant due to disrepair, to eventually be used again as social housing. One of CHHIP’s goals is to break down barriers to quality employment training opportunities. Along with providing the practical short-term supports that are often needed to work in construction– things like boots, a hard hat and a bus pass to get to the site – CHHIP also helps participants look to the longer term. It offers the opportunity to obtain high school credits and connects participants with resume preparation, job search and employment counselling services once the program is completed. Positive spaces, leadership training and employment preparation are giving youth in priority neighbourhoods a leg up through the HCF-supported Growing Youth Leaders project. The project is a partnership between the City of Hamilton’s recreation division and Riverdale and McQuesten neighbourhood residents and community development workers. The goal is to provide local youth with the necessary experience and skills to gain employment including recreational programming and leadership training and certification. Research from the Social Planning & Research Council underscores the importance of this project: youth is Hamilton’s fastest growing population, but many face issues associated with poverty including not completing high school and longer-term unemployment. Job training, experience and opportunities help to address these risks. Thirty-five hours of instruction including first-aid training, employment readiness and principles of healthy child development are designed to introduce youth to jobs in recreation and to build new skills. Participants have the opportunity to volunteer in a City of Hamilton rec centre, and all program graduates of are guaranteed an interview for paid recreation positions with the City.